No Erection: Flour Mill has been fixed along with motor on a strong compact steel frame with trolley wheels, so there is no need for ground foundation. Movable:- Flour Mill is fixed on Frame with trolley wheels gives the facility of moving it as per the requirement. The flour Mill is Compact and thus requires less space for installation. Ready to use:- Flour Mill has been fully assembled with fixed motor and technically balanced long lasting emery stones. No need for special setting of stones and thus is ready to use immediately after purchase. It gives high efficiency with Low heat generation because, slotting of Emery stones has been done by technically approved formula. Highly Efficient:-flour mill gives maximum average compared to other commercial flour mill. 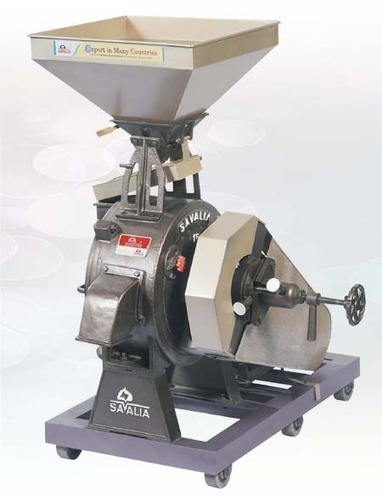 It is designed in such a way that it consumes 25% less power consumption then any other commercial flour mill. It is a combination of less power consumption and high output. Incepted in the year of 1999, Satyam Machinery is manufacturing, wholesaling, trading and retailing a broad plethora of Flour Mill, CRI Pump, Centrifugal Pump, Monoblock Pump and much more. Besides this, we check these on a variety of grounds before finally shipping them at the destination of our customers. Working under the mentorship of Mr. Vinubhai Ghinaiya, we have acquired a reputed stature in the industry.